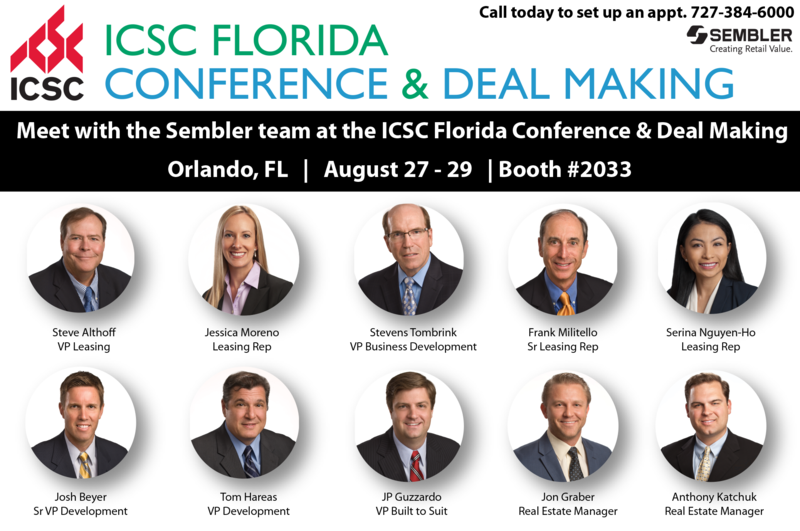 The Sembler Company is heading to Orlando for ICSC Florida Conference, August 27-29, with a full slate of projects throughout the southeastern U.S. and Puerto Rico to highlight. Visit Sembler at booth #2033. “We are looking forward to getting to Orlando to talk about opportunities in our new developments and acquisitions, in addition to our existing portfolio,” said Sembler CEO Ron Wheeler. “Our latest new development – Amberly Village – recently broke ground in Cary, North Carolina, after a very collaborative effort involving the Town of Cary, its residents and our anchor Publix. We’re proud of what that project will become as a result of that process. A Publix-anchored, non-traditional, pedestrian-oriented shopping center located in a growing Raleigh suburb. First commercial opportunity in the West Villages, a rapidly growing master-planned community between the urban centers of Venice and North Port. In addition to growing Sembler’s core business – centered on grocery-anchored centers and single-tenant, build-to-suit development – Sembler has entered into a new venture with Atlanta-based Berkley Development, led by industry veteran Mike Cohn. The Sembler/Berkley venture is seeking out retail projects primarily in the southeastern U.S.
Sembler is actively leasing its new ground-up development projects as well as centers already in the portfolio. Anchor tenant space is available at the newly acquired Humblewood Center, near Houston, TX, and Springwood Shopping Center in Austin, TX. Occupancy over Sembler’s entire managed portfolio averages approximately 95%, including Sembler-owned and third-party properties throughout the Southeastern U.S. and Puerto Rico. In 2017 to date, Sembler has already closed transactions on sales or ground leases for three outparcels – with more to come. The company’s build-to-suit division has active deals with category-leading users in a variety of industries – including Advance Auto Parts, O’Reilly’s Auto Parts, Take 5 Oil Change, Express Oil, Chick-Fil-A, McDonald’s, Wendy’s, Wawa, and Circle K.
In addition, Sembler is in the process of delivering an outparcel park consisting of 12 lots to complement the recently opened Publix-anchored shopping center in Trinity, FL. This outparcel park already has commitments from seven users, with active interest from many more. Construction is currently underway, with tenants opening in late 2017 and early 2018. FREP has already acquired two shopping centers in 2017: Seneca Square in Charlotte, NC, and Humblewood Center in Houston, TX. To date, FREP has invested in ten shopping centers in Florida, North Carolina and Texas, representing more than 1.3 million square feet of leasable area.